Please take a moment to help us to optimize our services and products and tell us your experiences with our interchangeable jewelry items. - What can be optimized at our web services? - Which items do you like most - which less? - Do you ou miss a product in our websop? we will try to consider this in our range of products. and send us some photos for our gallery. Please share your impression with others at our testimonials page. I did a show last weekend a sold all 15 of the long necklaces with single bead that I had. They were my best seller. Thanks for offering such an exciting product. I am really impressed with your line of product and always receive compliments when I wear them. Today with the mail was your package. When I opened it, I was really happy J. It is all very beautiful, the glass looks very good on it. It is much more beautiful than I expected! Thanks very much, in a time I will order some new materials. Just wanted to say thank you for your excellent customer service. My order was lost in transit, and after waiting a reasonable amount of time with no luck I received a replacement of my complete order. And this time it arrived with no problem, thank goodness! I have just started to play with all the pieces, and am looking forward to placing another order. Je suis très satisfaite de vos produits. Cela fait de très beaux pendentifs, le montage est facile et original. Je trouve que le site est très bien fait, on trouve ce que l'on veut très rapidement. Je vous mets en annexe quelques photos de mes montages. thank you so much for your feedback. We have added your lovely pictures to our gallery now. Some thoughts on your Interchangeables range. - The curved necklace looks great and is easy to assemble my only issue is I would prefer it to come with the silver plated neckband rather than the stainless. So far I’ve used the curved section with the silver plated neck bands sold separately. - The classic necklace has the same issue I would prefer to have a silver plated option, I also think this would make the piece look even more professional. - I’d also like to see a 4mm round endpart ball the 5mm is just a little too big. thank you so much for your feedback and the great suggestions. Within the next few days we'll upgrade the curved necklace in that way that you can also order this item with a silver plated neckwire instead of the stainless steel neckwire. The classic necklace cannot be upgraded so easy, because the used stainless steel band is much more softer than the silver plated one and the look will be very different. But I think we'll find an alternative soon. Threaded ball end in 4mm - great idea !!! But this very small ball will become slightly more expensive because the robot, which produce this item, needs more time for cutting the threadings. We'll add this 4mm balls with threadings at our shop during December 2013. Your website, to me anyway, seems pretty easy to negotiate and find what you need without much difficulity. The search engine and shopping cart, which are very important to a selling type website works fine. The product line is beautiful although my wife and I are not too crazy about the Artistic parts and have not ordered from that catagory as of yet. We have a lady's boutique shop that handles loads of dress and accessories for woman here in the US. Our customers seem to really like the sleek look of your silvered products and not the antique look of some of the others. We find the entire concept to be easily sold and explained to our customers. I provide the beads from my lampworking hobby and my wife puts them together. We just love the concept of making our own bead cap ends...........thanks for the tutorial. Cannot wait for our seemingly, to us anyway, large order to arrive. You have already let us know that it was shipped and even that small communication was wonderful. Cannot say much more other than the fact the system is selling itself. We display finished products in various focal points throughout the shop. Will follow up with some pics later. The new artistic parts have a brushed finish to give them an artistic look. In january 2014 we'll add the same items with a smooth finish in the hope this will better suit to your customers' expectations. Your necklaces have been selling fast at our new store, in fact we only have 2 of the circular ones left. Please ship our order ASAP. We are closed for Thanksgiving week (no business during the holidays at a shop like ours), so your regular shipping method is just fine. We think your products are fantastic and your website is absolutely grand. Easy to get around and very much to the point. Thanks so much for everything. my package finally arrived thank you so much, I really love your products I will make another order soon. I am thrilled with your products. I see the possibilities as endless. I am very attracted to your concepts and designs. Cubes, cylinders and spheres are my favorite shapes. I am designing ear-rings with your product and so far I love the designs. I have been gathering inventory to go up with a shop/Etsy/Web site or do a show etc., so I have not experienced any sales or customer/client response yet. But I didn't want to invest in silversmithing tools or equipment just now as I'm very engrossed in designing glass beads. I have sharpened my skills for two years and I pronounce myself now ready to sell. I like the finished product; it's modern and spare. I wear them and I'm pretty hip and very particular and only wear my own stuff... so we'll see shortly if I can sell it or not. Thanks for your hard work and the bonus discount. Generous indeed! yes I was satisfied with your products & like them very much the way they enhance your beads. They are a Great product :-) Have a Great Weekend. I was more than happy with my purchase. The BeadHoppers were a gift and were well received. I may purchase more with the coupon - good reminder. I love your products, I’m 100 % satisfied with your goods and with your service! I’m sure I will order again your beautiful products. Since I use the interchangeable jewelry a new world opened for me and I love it. To be quite honest I can not pick out a favourite as I Iove them all. I am 100% satisfied and the service is excellent. I like your products very much. I would like to have them or at least some of them in sterling silver. Unfortunately the threaded parts of the system cannot be produced in sterling silver. Sterling Silver is definitely a beautiful material to create jewelry with, but it is too soft to hold the threadings a long time. For this reason Beadhoppers chooses to manufacture the system pieces with brass, a much harder material - and each piece is high quality plated with silver. Absolutely stunning. Infinite possibilities and totally unique. I can't wait to wear this to the museum where I work. Thanks so much for your wonderfully creative product! I love your website and your products. I have to place another order in the next couple days. Your products are AWESOME. I LOVE your Beadhoppers (as you’ll see from the fact that I came back and ordered more yesterday, after my first order arrived here in the UK!). They are truly wonderful and it’s now soooo easy to wear my beads! Hi guys. Thought I would send some good thoughts your way. I love your product. For my sanity and happiness, I create beads. My husband gave me the gift of a studio on my 50th birthday, 2 years ago. Oh wait, almost 3 years ago! Anyway, I wanted to let you know how thrilled I am with your product. 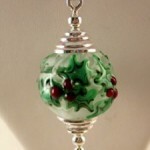 I have included photos which are not great, haven’t ventured into the Etsy thing to learn good photography. But wanted to share with you what I will be presenting at the Rock and Gem show in Edmonds December 1st. That is why I am so anxious to get my hands on more of your product ! I look forward to years of enjoying creating wearable jewelry with your product. I just bought your BeadHopper system and am very excited to use them. I have been waiting a long time for someone to offer an interchangeable beading system like this! Thanks for this great new product, and for your help. I finally received my order and I'm very pleased with them! I'm attaching pictures of what I made with them and they are going to the Arts Council gift shop to see how they sell. I HATE making jewelry, but it seems my beads sell much easier if they are ready to wear. Thanks for turning me on to Beadhoppers! I love this concept, but wondered how it would do with heavy beads. So today I put a very big, heavy round on and really stacked it up with components. 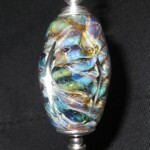 I have it on one of the Beadhopper neck wires and am “test driving” it. So far, so good! Thanks for a beautiful, fun product! I have been admiring your lamp work for some time now, never been able to snag any of your beads (or frogs) as by the time I get on the website, they are all sold. Which is a good thing for you, bad for me. But then you introduced Beadhoppers and I ordered and received my shipment just this week. I am thrilled, thank you so much. The idea of beadhoppers is genius. The website is super classy, the product is phenomenal. Well done, I wish you and Tom all the best with the business and by the way, nothing better than a true german design and product, website, Beadhoppers and your lamp work. Congratulations and good luck, I am a huge fan. Just received my order and an thrilled with your new product! Put together several necklaces and am ready to order more! Suggestion....sure could use an 80mm Pendant rod. 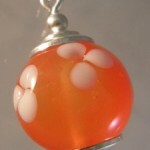 I have several large pendants which look stunning with the stacks on top....BUT, 70mm too short! 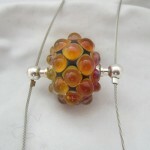 Will set this pendant aside in hopes that you will sell longer pendant rods with even longer "tubes" for stabilization. Perhaps Tom can design a stabilization tube which accepts (screws in) another pendant rod for longer lengths.....Just a thought. 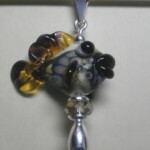 I love making fish beads and have never been able to find a way to wear them as a pendant that I was satisfied with. I spent a bit of money trying things that just didn't work or look good. When I got the email regarding the Beadhoppers, OMG, I knew this was it! 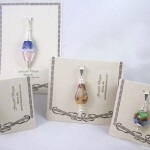 I purchased the starter kit and now have three of my fish that I can "show off" as pendants. Now I need to place another order. Thanks so much. I am looking at my other beads that need to be worn! Beadhoppers are the most amazing jewellery building components I've ever used. The fact that you can change your mind and bead almost as quickly is brilliant and its not only pendants you can also make earrings, as I discovered. There's no more painful wire work, pinching your fingers in pliers and if you don't like it you can change it quicker than I would have believed possible. I'm in love and can't stop playing with design possibilities and beads, it's very hard to put beadhoppers down in order to do other more important things like dinner for the family! Thank-you so much for introducing me to them. Hi! This is the first bead I tried making something out of using your kit. I didn't expect this bead would ever be used for anything wearable, however with your quality easy to use kit, it's now something I would feel good giving as a gift. Amazing! I'm going to keep "playing". I am having fun pulling out all these beads I had long forgot about, and giving them new life. How fun is this! How about now: I really had no idea what I was going to do with these beads, now I do! I love this kit, and having shown it to a few friends now, I believe it to be a hit.